All-in-one design accommodates both keyboard and mouse with a mousing surface that can be positioned on the left or right. 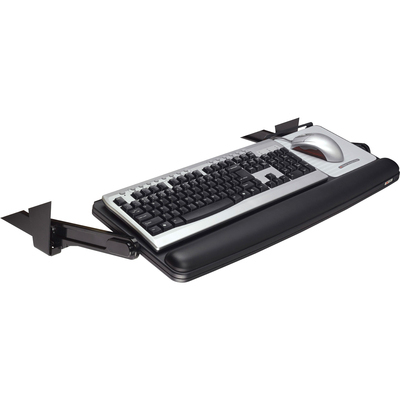 Keyboard tray provides height adjustments and adjustable tilt to create a personal fit. Wide platform places the mouse directly beside the keyboard for added comfort and convenience. Leatherette gel wrist rest with antimicrobial product protection. 3M™ Precise™ Mouse Pad can be placed to right or left of keyboard. Unique design offers height and tilt adjustability on par with articulating keyboard trays. Wide platform places the mouse directly beside the keyboard for added comfort and convenience. Leatherette gel wrist rest with antimicrobial product protection. 3M™ Precise™ Mouse Pad can be placed to right or left of keyboard. Installation depth required: 20", width required: 31"